From the spindle, the yarn is wound onto this nifty little contraption known as a niddy noddy. Cute, isn't it? 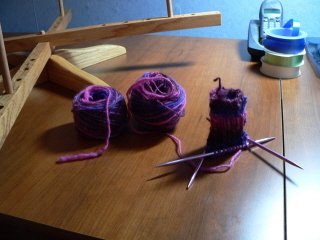 Two little baby skeins later, a mitten is started. 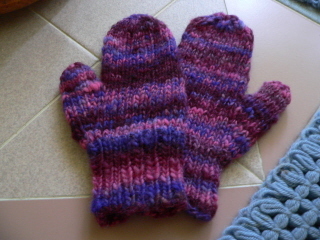 Mittens are complete, my first uneven, wacky-looking handspun project. 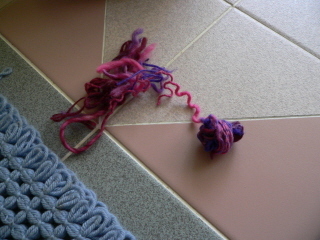 This is the amount of yarn I had left after the mittens were complete. I had to rip out the gauge swatch to finish them. Talk about cutting it close! 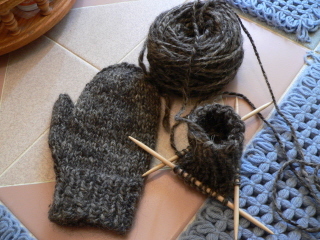 One mitten done and one in progress. The fiber for this yarn, llama and wool, is from animals raised here on Long Island, handspun by someone who obviously knows what she's doing! I bought this yarn at a shop in Sayville. They should be warm. I plan to line them with fleece fabric so they won't be scratchy. 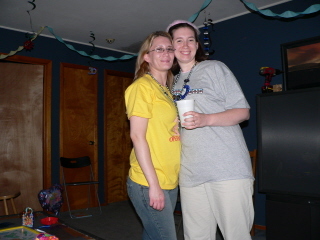 Last night, Sue and I interpreted Joseph and the Amazing Technicolor Dreamcoat. It was so much fun. I know every word of that show so it was easy for me, although I had to make a cheat sheet for the colors. I know all the words but I had to write it up in the signs for the colors so I'd be able to follow it. That worked like a charm. At the curtain call, the actor playing Joseph signed the I Love You sign (ILY) and our faithful deaf theatregoer was quite excited about that. The next show we'll do at Smithtown is Sweeney Todd in October. Sondheim is so hard to interpret. The songs can be so fast and there's so much information! I'm starting to work on it now. Before that, we'll interpret Oklahoma at Hofstra next month. We just did that one at Smithtown so we've already done all the work on it. Well, it's Labor Day weekend. I can't believe the summer's over already. We don't have any real plans for the weekend and I still don't know if I'll be working this school year. Apparently, I won't be working in September but I have hopes about later in the year. We'll see. 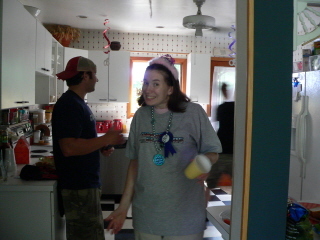 Oh no, the big 30! 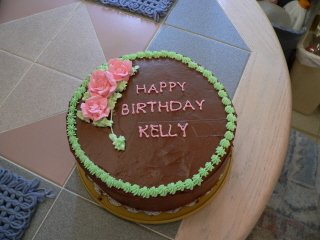 On Monday, the 27th, Kelly will be 30 years old. 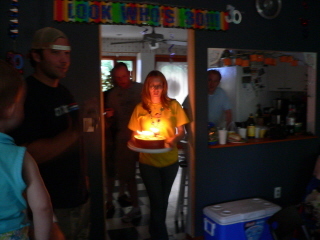 She's made it known for several months now that she expected a party, a surprise party in fact, for this milestone. After some stressful planning, success! 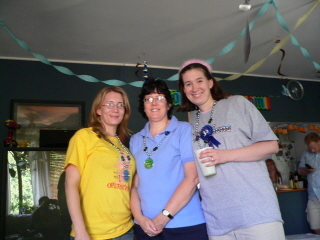 It was party time. I baked the cake yesterday afternoon. The trouble is, Kelly and Lorelai always come here for dinner Friday evenings after work. 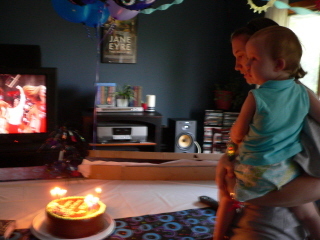 I realized that the scent of freshly baked cake was pretty strong in the house. So, I opened every window and door and turned on the overhead fan in the kitchen and the exhaust fan. Then, I started cooking dinner, hoping that would mask the scent. It was also necessary to wash everything connected with the cake and put everything away. No evidence was visible by the time they arrived. 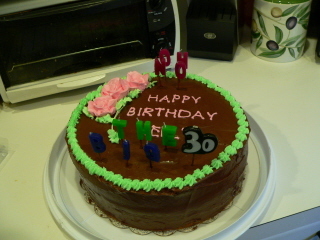 Of course, that meant that I had to decorate the cake this morning. It looked fine, despite the fact that I haven't decorated a cake in years. 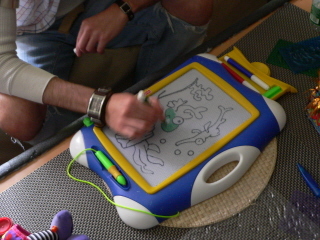 It was also a lot easier pre-arthritis. 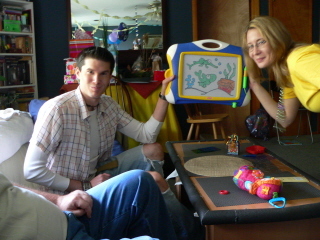 I had the task of taking Kelly out and keeping her busy so Mike, Kim and Sean could get things ready at their apartment. I kept waiting to hear from Kelly about when she'd be ready to go. Kim text-messaged Mike to ask if she was still there. His reply? "Yes. Get her out!" All the text messages back and forth were fun. I felt like we should synchronize our watches. 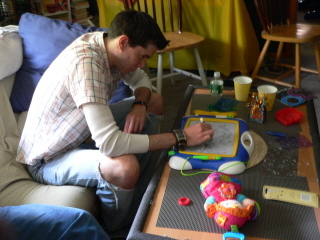 Billy playing with Lorelai's magnadoodle. He was really into the stencils and, especially, the dry erase colored markers. Lorelai helps Mama open her gifts. 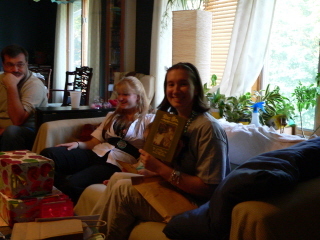 One of her gifts from Mike, a beautiful vintage edition Peter Pan in Kensington Park. Oh no! 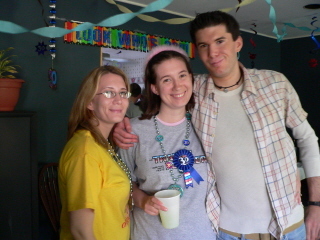 The big 30! She got most of it in her mouth. 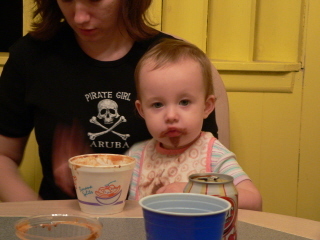 If I didn't know better, I'd think someone drew a beard and mustache on the kid. 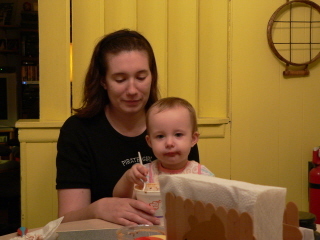 Mama gets some ice cream, too. 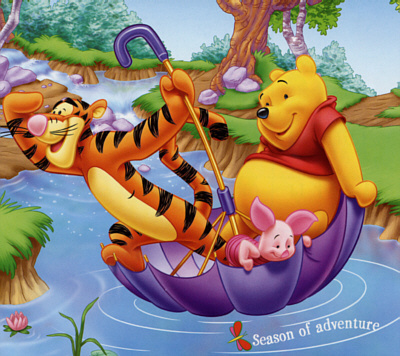 Pooh, of course, prefers honey. 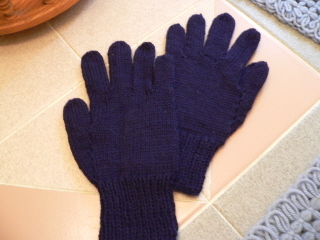 Another completed project, the tweedy gloves made with the 50% merino wool/50% yak yarn. Yak yarn. Try saying that three times fast. I'm delighted with them, they're so soft. 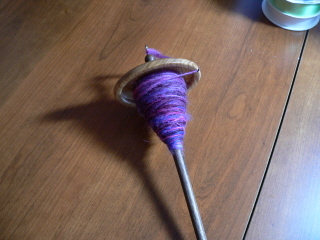 This is the most I've gotten on the spindle so far. I have more of this fiber left (color called roses and lilacs) and if I can get at least another 50 yards, I can make something. Up to this point, I've made only swatches. One project finished from the pile. I used the pattern chart in Ann Budd's book, The Knitter's Handy Book of Patterns. I've had this yarn for years. It's just plain blue wool. But I never had a glove pattern that would work with this weight yarn and I didn't have enough to make anything like a sweater. I always thought this yarn would make great mittens or gloves, though. With the pattern charts in this book, I could make gloves to fit from my swatch/gauge and these gloves fit me better than any I've ever had or made. The weather is cooling and it's starting to feel like fall is on its way. What a difference a couple of weeks can make. It's refreshing, although it will be nicer when it's not raining so much. Friday evening, after that thunderstorm we had, it was so windy and cooled off considerably. As much as I hate the cold weather, I do love the change of seasons in the northeast. It's been ten days and I can't think of a single interesting thing to write about. Not much is new here. I have a few chores around the house I'd like to complete soon but I just can't get myself moving to do them. I can always find an excuse, another project I can work on. Once I get started, I'll get them done. 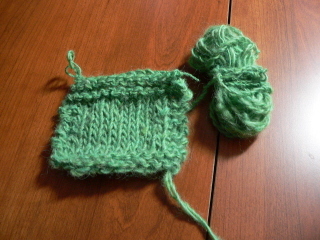 I made a little swatch with my first plied yarn the other day. It looks ok. I got a little confused sometimes plying the two strands. 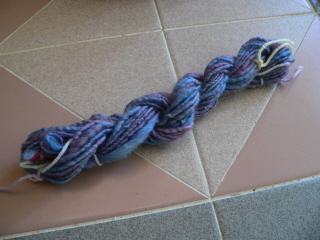 The two strands were spun in the clockwise direction, so I have to ply them counterclockwise. 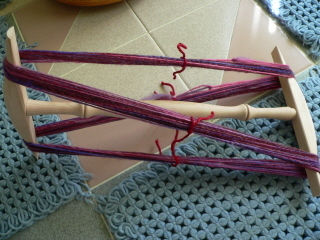 Sometimes, I forgot and once I wound the yarn on the spindle, continued in the clockwise direction because I was so used to going that way. So, there are a few spots where the strands are side-by-side but not actually plied. For a first attempt, it doesn't look too bad. Kim's birthday is tomorrow so her friends and her sister and brother are taking her to a show tonight in the city. This will be interesting. Billy is not a theatre guy. In his words, "I play sports". So, I'll be interested to see what his reaction is to this experience. Since Kelly is going, I'm going to be babysitting with Lorelai tonight. It's always fun spending time with her. 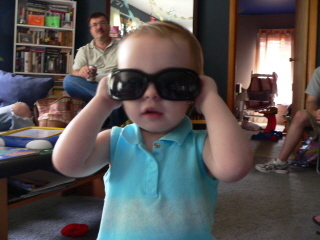 She's such a character. Wow, it's hot. 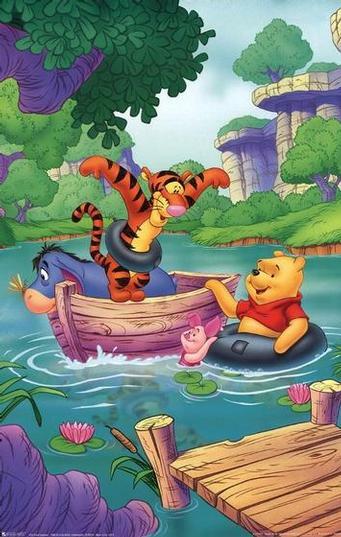 We should all be floating down a river with Pooh and the gang. Holy cow. Look, something that actually resembles yarn! 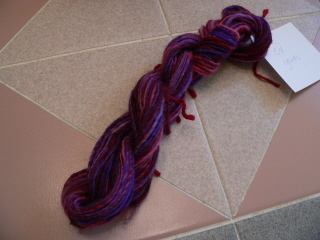 Yeah, there are thick and thin spots but it looks like the yarn you buy that's made to look like handspun. The ladies at the spin guild say it's "designer yarn" and that even if they wanted this look, they can't do it anymore. So, I'm glad I have pictures of my earliest attempts so I can look back in a year or so and wonder if I can do that again. What I have on the spindles now looks more even so I'm getting the hang of it. I have a box full of wonderful fiber. It's such a pleasure to touch it and explore the possibilities. 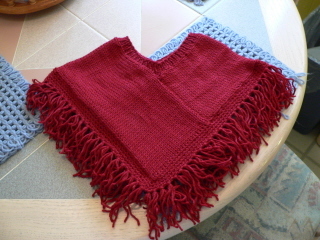 Lorelai's second poncho, same yarn and same color as the first one, just a larger size. I actually made both at the same time. I just didn't assemble this one and finish it until this week. It's about that time, getting things ready for the fall and winter. I'm working on several projects and I have a few I'd like to finish before I start anything else. I can't believe I've held out this long not starting anything new. 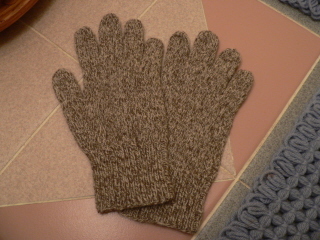 I have two gloves that need mates and two socks that need the second to complete the pair. Then, I have that gold cardigan for myself I'd like to finish soon. It's the perfect weight and color for the fall and I'd like to have it ready to wear. I have that rose color gansey to finish but I'll wait on that one a little while. 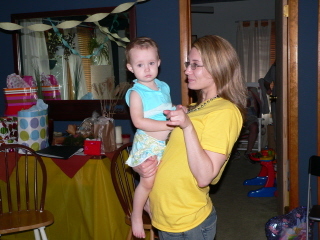 When I get these things done, I'd like to start a couple of things for Lorelai. I have some yarn for socks and sweaters. The best thing about working on her projects is that they're fast. So, I'll keep busy.